Sony Music Entertainment Australia is thrilled to announce that John Farnham and Olivia Newton-John’s new album FRIENDS FOR CHRISTMAS, has reached number one on the ARIA Albums Chart and achieved platinum sales accreditation. The album embodies a traditional Christmas sound whilst showcasing their ever impressive vocals. John and Olivia’s last collaborative album TWO STRONG HEARTS also reached number one on the ARIA Albums Chart, making this FRIENDS FOR CHRISTMAS their second consecutive number one in two years. The lush production on FRIENDS FOR CHRISTMAS was handled by Farnham’s long-time musical maestro Chong Lim, who has also worked with Delta Goodrem, Kylie Minogue and Tina Arena. 19 time ARIA Award winner and all-round top guy, John Farnham continues to be ‘The Voice’ of Australian music, thrilling audiences with his onstage charisma and those unforgettable vocals. John will be performing live with his long-time celebrated band featuring Chong Lim, Stuart Fraser, Brett Garsed and favourite backing vocals Lindsay Field and Lisa Edwards. Experience this incredible performance of Australian music in the stunning surrounds of Rottnest Island, overlooking the majestic Thomson Bay. Last night John Farnham closed the ARIA Awards, performing ‘You’re The Voice’ to celebrate the 30th anniversary of both the ARIAs and his classic album The Whispering Jack. At the first ARIAs in 1987, John won six awards including Best Male Artist, Album of the Year and Single of the Year. Today John Farnham releases his new album Friends For Christmas with Olivia Newton-John. The album embodies a traditional Christmas sound whilst showcasing the ever impressive vocals of both artists. As John explains, “I have always loved working with Olivia. To record a Christmas album seemed like the right, almost inevitable thing to do. I hope everyone enjoys listening to it as much as we loved recording it together”. When John and Olivia’s Two Strong Hearts joint tour finished last year the two friends didn’t want the fun to end. That tour, which spawned a #1 album and DVD, lit a creative fire which led them to the studio to record new versions of their favourite Christmas classics as duets. To Celebrate the 30th Anniversary of John Farnham‘s 24x Platinum selling album ‘Whispering Jack’, a numbered limited edition deluxe boxset ‘The Complete Whispering Jack’ is released today which includes never before seen content from the recording of the album. ‘Whispering Jack’ was the twelfth studio album by John Farnham, first released in 1986, and has found iconic status in Australia’s music history. It was also the first Australian-made album to be released on Compact Disc within Australia and contains the all-time classics “You’re The Voice” and “Pressure Down”. John appeared yesterday on The Today Show with Richard Wilkins, discussing the making of ‘Whispering Jack’ and it’s impact on John’s career. 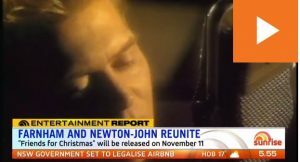 Australian television programs, Sunrise, The Morning Show and The Today Show have led the announce of John Farnham and Olivia Newton-John’s upcoming Christmas album, ‘Friends for Christmas’, set to be released November 11. Click the images below to watch. 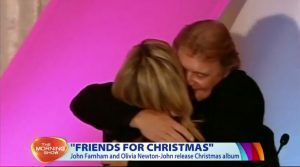 Sunrise: John Farnham and Olivia Newton-John make ‘Friends for Christmas’. 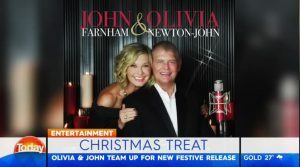 The Today Show: Olivia Newton-John and John Farnham release Christmas album. John Farnham and long time friend Olivia Newton-John have released word over a new Christmas album, ‘Friends For Christmas’, set to be released on November 11 of this year. The album, currently available for pre-order, has the pair singing a number of classic duets including, ‘Have Yourself a Merry Little Christmas’, ‘Baby It’s Cold Outside’, ‘Silent Night’ and more. “To record a Christmas album (together) seemed like the right, almost inevitable thing to do…I hope everyone enjoys listening to it as much as we loved recording it together”–Farnham (news.com.au). WIN a Two Strong Hearts LIVE Tour Poster Signed by John Farnham! Do you want to WIN this ‪#‎TwoStrongHeartsLIVE‬ poster signed by John Farnham? It’s simple to enter! The entry with the most creative answer will win and be announced a 3pm on DVD release day, Friday, August 21 via John Farnham’s Facebook page! Entries close Thursday August 20 at Midnight. The new live DVD from John Farnham and Olivia Newton-John, TWO STRONG HEARTS LIVE IN CONCERT, is set for release on Friday August 21st 2015. The DVD is available to pre-order from today and the ARIA #1 companion highlights album is out now! TWO STRONG HEARTS LIVE debuted at #1 on the Official ARIA Albums Chart and remained in that position for 3 weeks. The album is ARIA certified as a GOLD selling title. The new DVD is the full ‘Two Strong Hearts’ concert filmed at Rod Laver Arena in Melbourne on April 8th 2015. If you missed out on securing tickets to see the live concert, this is your chance to share in the magic that was ‘Two Strong Hearts’ live on stage. If you were one of the extremely fortunate people who got to experience the joy first hand, this is your chance to relive that incredible experience! With Chong Lim leading the 60 piece orchestra, alongside Farnham’s core band and singers, audiences were treated to a thrilling series of shows that saw both John Farnham and Olivia Newton-John dig into their own personal career songbooks with stunning results. Highlights on this DVD include ‘Two Strong Hearts’, ‘Let Me Be There’, ‘Xanadu’, the Peter Allen penned ‘I Honestly Love You’ and a sublime ‘Tenterfield Saddler’, ‘Dare To Dream’ (first heard at the Sydney OLYMPICS 2000), ‘Somewhere Over The Rainbow’, ‘Burn For You’ and the jazz/blues hybrid of ‘Hit The Road Jack’ and ‘Fever’.